A super retro dip—try it and you'll wonder what took you so long! Add beans and water to a saucepan. Add onions, garlic, dried oregano, dried cilantro, cumin, coriander, and kosher salt. Bring to a boil, and then reduce to a simmer. Cook until very tender. Mash the beans with a potato masher or use a submersible blender. Add the warm bean layer to the bottom of a 9 x 13-inch dish. Add the shredded cheese on top of the beans. If you are making this dip spicy, add the optional jalapeños and green chilies. Add sour cream, garlic powder, onion powder, and cumin to a bowl. Mix well, then spread on top of the cheese layer in the dish. Add the avocados, cilantro, lime juice, and garlic to a bowl. Mash the avocados with a fork and mix well. Spread this layer on top of the sour cream layer. Mix tomatoes, cilantro, and kosher salt in a mixing bowl. Mix well and spread on top of guacamole layer. Top pico de gallo layer with the chopped green onions. 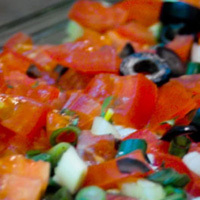 Layer sliced olives on top of the chopped green onions.